Today Bill Richmond is largely unknown to the wider public, but he was one of the most significant sportsmen in history and one of the most prominent celebrities of Georgian times. Born into slavery in Staten Island, Richmond won his freedom as a young boy and carved a new life for himself in England as a cabinet maker and then a renowned prizefighter and trainer. His amazing life encompassed encounters and relationships with some of the most prominent men of the age, including Earl Percy, William Hazlitt, Lord Byron, the Prince Regent and Lord Camelford. His fame was such that he fulfilled an official role at the coronation celebrations of King George IV in 1821. 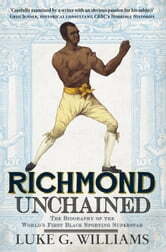 The story of Bill Richmond is an incredible tale of personal advancement, as well as the story of a life informed and influenced by a series of turbulent historical events, including the American War of Independence, the fight for black emancipation and Britain’s long-running conflict with Napoleon Bonaparte.